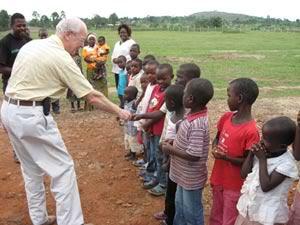 Pastor Ernest, accompanied by Pastor Mike Smith of New Life Family Church in Suffolk, England, undertook an intensive 14 day tour of several towns in Uganda, teaching and encouraging pastors and leaders in many areas of ministry. A 2 day seminar was held in Mbale, and Abundant Life International Ministries (ALIM) invited pastors and their wives, with whom ALIM work very closely, to attend. Subjects addressed were “Marriage in Ministry and the Church”, “Integrity”, “Accountability”, “Honesty”, and “Having A Biblical Attitude to Work”. The speakers also focused on the need to have the right attitude to business and businessmen within the church. 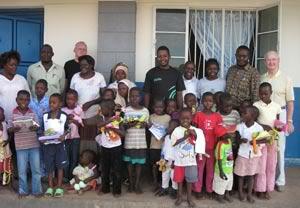 Also in Mbale, a visit was made to “My Fathers House” children's home, where ALIM provide for all the needs of 20 orphans. 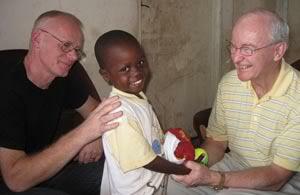 All the children were prayed for, with laying on of hands, by pastors Mike and Ernest. Afterward Christmas gifts, provided by sponsors in Northern Ireland, were distributed, For most of the children, this was the first time they had ever received a gift. following the crusade in September. 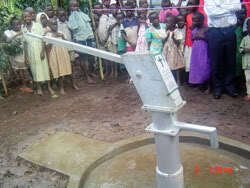 A well, serving 2000 people with clean water was also dedicated. The team moved on to Mbarara, for a 3 day conference, attended by 400 pastors and leaders, ALIM provided food and accommodation for the delegates. 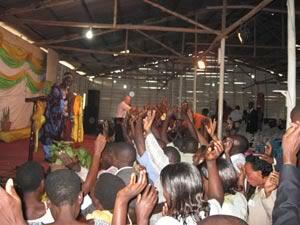 200 of those attending received the baptism of the Holy Spirit. There was great excitement and rejoicing as so many leaders were empowered as in Acts 2 v 4. The final town visited was Rukingiri. 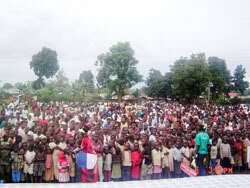 Here the attendance was even greater, with approximately 600 present, over a period of 3 days. 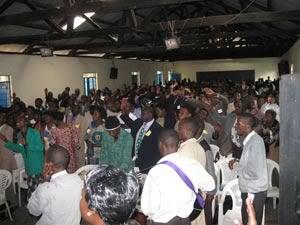 Once again the appointing power of God fell, and over 400 pastors and leaders received the baptism of the Holy Spirit. 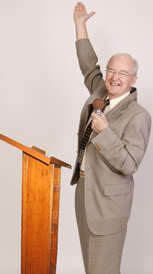 The subjects covered at both conferences included “The Fear of the Lord,” “Walking in His Marvellous Light,” “Being Led by The Spirit,” “Rededicating Marriages to the Glory of God,” “Living in the Power of Signs and Wonders”. Many testimonies were received from delegates of how God had opened their spiritual eyes, to go to a new level in their life and ministry. 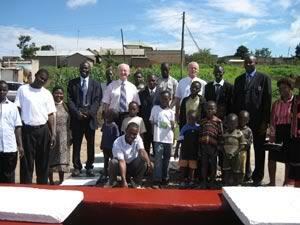 Pastor Ernest and Mike also visited “Aids” families, who had been blessed with cows, during a previous visit in 2008. These families, previously suffering from low self esteem, and being socially outcast were enjoying a much better quality of life, and giving glory to God for the changes which had taken place. 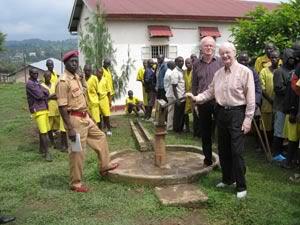 The pastors visited a local prison in Rukingiri, with 400 prisoners, and agreed to carry out the necessary repairs to a borehole in the prison, which had ceased to operate. The commanding officer together with all the prisoners, thanked God for His goodness. Most of the prisoners responded to an altar call from Pastor Mike, and surrendered their lives to Jesus. 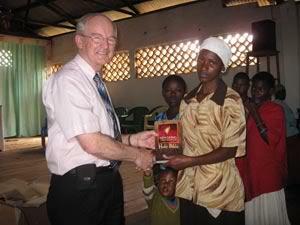 Pastor Ernest was particularly touched to meet a lady named Patience. When ALIM visited Rukingiri in January 2008, she told Pastor Thelma that she had been married for many years, but had no children. Pastor Thelma laid hands on her at that time, and prayed that God would bring forth life from her womb. 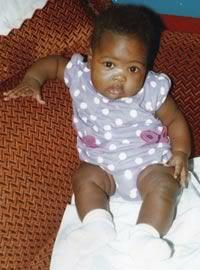 Now, in December 2009, patience presented Pastor Ernest with a photograph of Valeria, her six month old daughter. 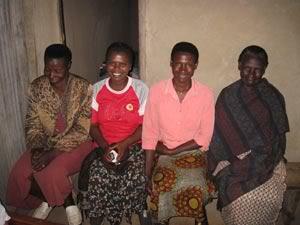 We praise God for the joy that God brought to Patience and her husband through our ministry.